Somewhere in Kobe, Japan, a man named Shoichiro Irimajiri is sitting quietly with a satisfied smile on his face and the sort of grin that says “I told you so!” Not only is he the man behind the legendary Honda CBX Six Cylinder that now commands premium prices by collectors he’s also responsible for the CX500, once derided as the “Plastic Maggot” it’s now the base of some of the very best custom motorcycles built to date. It seems even the good folks in the Honda marketing department knew it might be a while for the potential of the CX to catch on. “First into the Future!” was their pitch, but after years as a lowly commuter bike some are taking the Honda to the levels it always deserved. 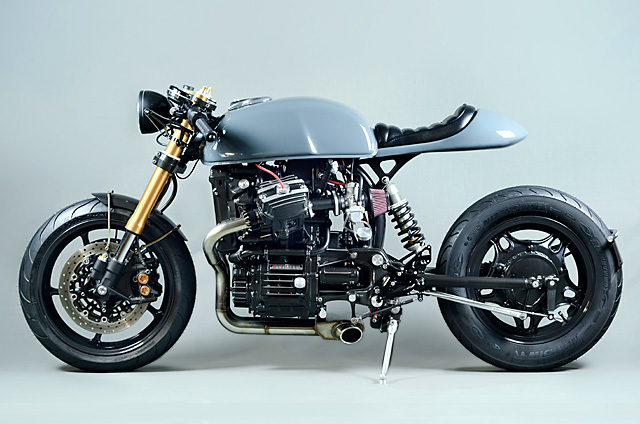 One such company is BBCR Engineering and their latest ride, a 1978 Honda CX500 known as BBCR507, shows the enormous potential that’s always lurked under the maggot’s skin. Head Honcho at BBCR is fabricator extraordinaire Andrei who originally hails from the small European Republic of Moldova. “We don’t have the same amount of bikes or capabilities to get them. 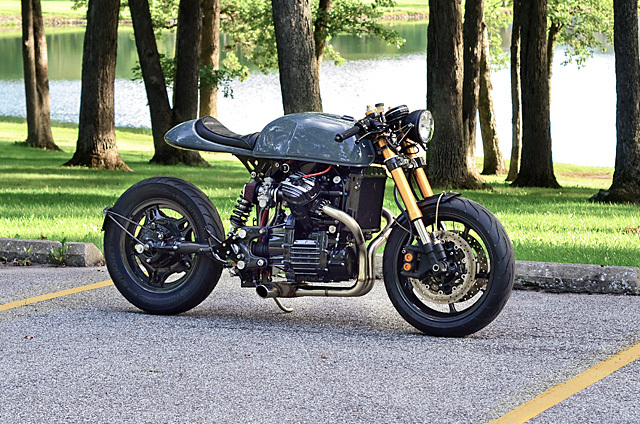 So I first started riding a Honda CBR600, went to a CBR1000 and that’s how I fell in love with Honda bikes.” But five years ago on his first trip to the USA he discovered the Cafe Racer scene and now with a shop in Southern Chicago, life has never been the same. 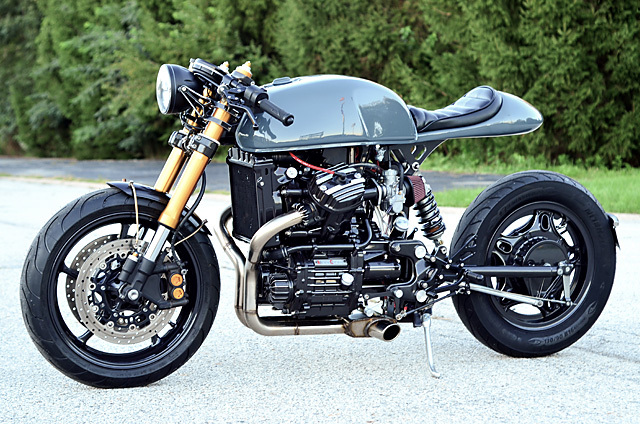 Just in the past two years, on top of the fabrication work, parts and kits he makes for the CX500, seven of the nine custom bikes he’s built have been CX500’s as well. 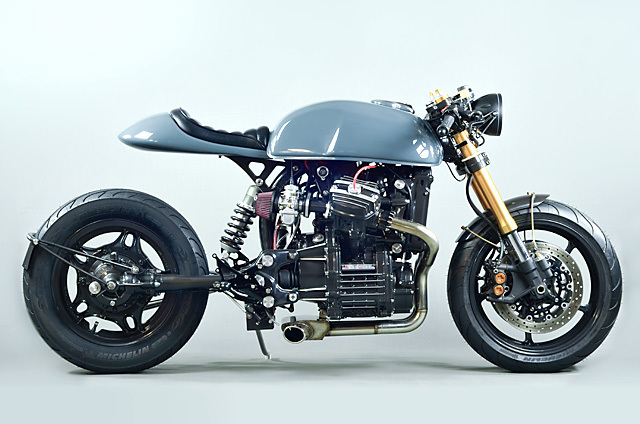 Having mainly focussed on Bobber styled bikes with his CX builds in the past, the customer who came forward to request BBCR507 gave Andrei artistic license to create something special and immediately the focus was turned to a Cafe Racer with plenty of modern sportsbike appeal. It all starts with a machine from the first year of production, a 1978 Deluxe, and before he gets started its back to a bare frame. 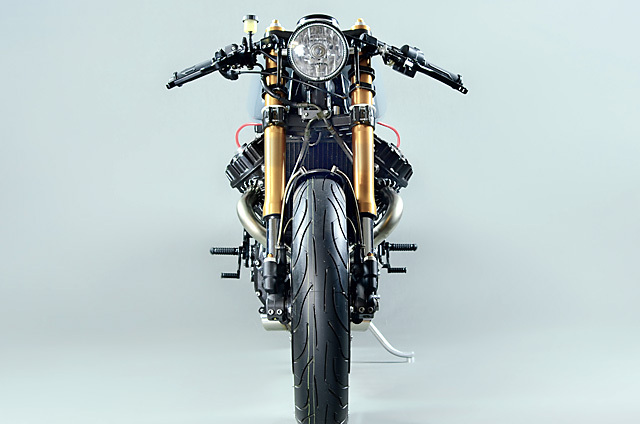 The entire rear subframe, including the rear fuel tank support is cut off and thus the journey to a mono-shock ride commences as the supports for the standard twin shocks are part of the factory subframe. The back bone then has to be neatly ground back removing the factory mounting tabs and the lower frame tubes are welded over for an exceptionally neat finish. One of the things BBCR does is machine beautiful Aluminium parts and all the factory rubber and plastic frame plugs have been replaced with BBCR originals that give a big dollar look to the commuter bike. Then to make the big change over to a frame capable of running a mono-shock setup Andrei bolted to the frame one of his own CNC alloy subframes that brilliantly incorporates the rear tank mount, seat mount and top shock mount all in one neatly fabricated piece. With the idea to go for sportsbike looks new tank mounts were fabricated and welded to the backbone before everything was given a coat of pearl black paint. The body work could then commence with the factory Deluxe tank being body worked back to arrow straight proportions and given a Northern Tank liner treatment. 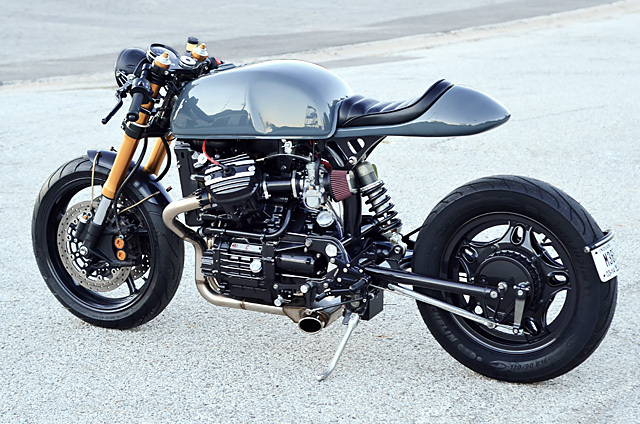 To complement the tank and give a different look to the usual bobber seats that Andrei fits to his CX builds he handcrafted the new Cafe Racer tail-piece from fiberglass that with its curvaceous lines and smooth edges brilliantly offsets the big Deluxe tank. The single colour and no graphics might be a rare sight these days but on BBCR507 it looks a treat and the hue comes from the Jeep catalogue, the blue tinged grey is known as Anvil and looks as tough as nails in the flesh. 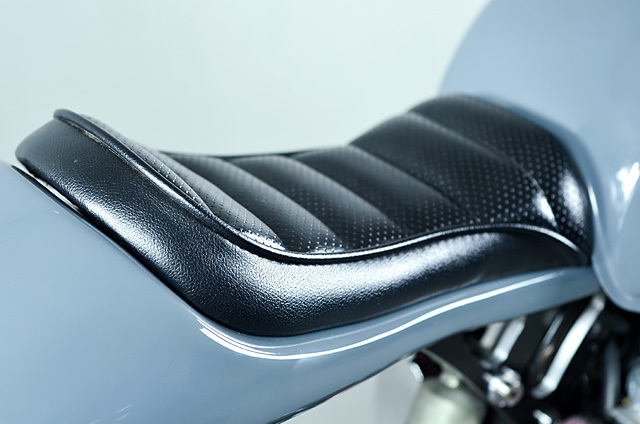 To give the bike a classy final finish the seat is classic black with piping separating the perforated stitched leather from the smooth finished hide. 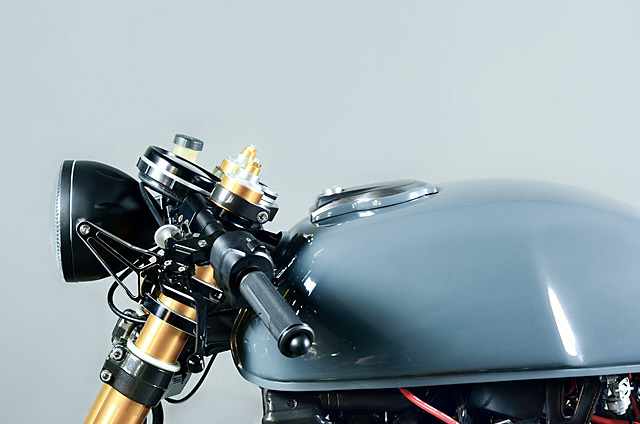 The rest of the body work is kept minimal; a stainless steel front fender is supported by round stainless mounts, torched to bring out their brilliant gold. While out back the fender/number plate holder is another touch of Andrei’s ingenious design skills with the wrap around item mounted off the rear drive housing. But what really gives that modern sportsbike feel is the suspension and brake package and it is dominated by the 2014 Yamaha R6 Gold inverted forks. To make these work with the decades older Honda frame a custom BBCR stem was machined and so too a set of aluminium stoppers. While the Yamaha also lends its power packed 4 piston calipers, 310mm twin discs and lightweight five spoked wheel that is shod with a Michelin Pilot Power 120/70-17. Out the back the standard shaft drive swingarm remains in place but has been smoothed of its shock mount on the left side and a new mount that Andrei fabricates welded into place in a more standardised mono-shock arrangement. The shock itself is from a Ducati Monster with an upgraded Ohlins spring that’s painted in the same black as the engine and frame. A chunky Michelin Commander in a 130 section wraps around the stock rear wheel but what will really excite the CX fans are the rearsets. 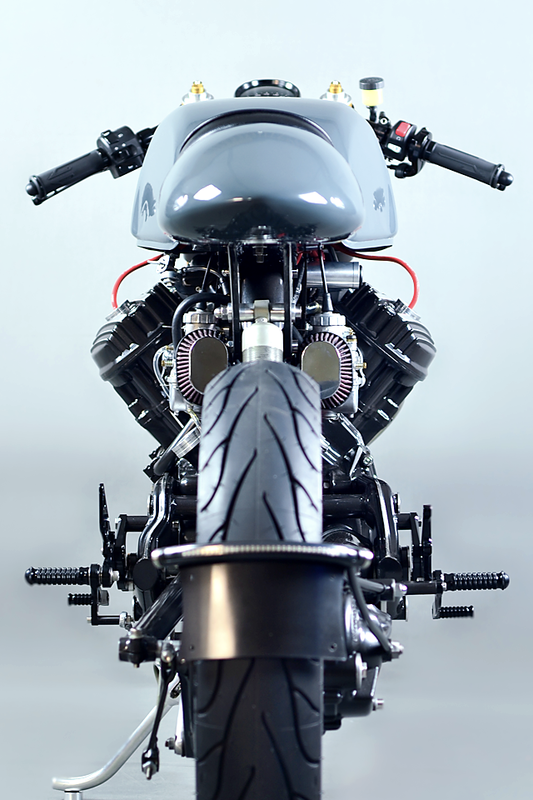 Starting with Kawasaki CNC aluminium units they were modified to fit, before Andrei fabricated linkages to match the notoriously difficult to work with CX500 shifter and rear brake. It’s this level of detail and workmanship that will have many pouring over BBCR507, analysing how Andrei overcomes many of the obstacles the CX throws up and the engine is yet another example. Just from the visual stand point the engine coated in high temp 2k primer and clearcoat with the base the same pearl black as the frame and wheels looks incredible. There are polished edges everywhere you look and CX650 valve covers are given the same polished lines to match. Inside the all-important triple bypass has been taken care of with a new cam chain, mechanical seal and a Rick’s stator, all part of the vital maintenance work needed on a CX500 when the engines out. Feeding the beast is a new set of carbs that replace the factory Keihin’s, mounted on custom intakes are a pair of Murray’s Mikuni carbs breathing through twin pod filters. There are BBCR’s own machined aluminium plug covers, dipstick, coolant plug, engraved engine plates and fin polished oil filter housing. But what really steals the show is Andrei’s unique exhaust design complete with perfect welds at every spot; the two into one system finishing under the engine with a one-off collector box with twin outlets. Everything that controls the party is just as impressive and it starts with a turn of the key in the machined alloy barrel that lets the hidden in a box Ballistic 8 cell battery know it’s time to play. 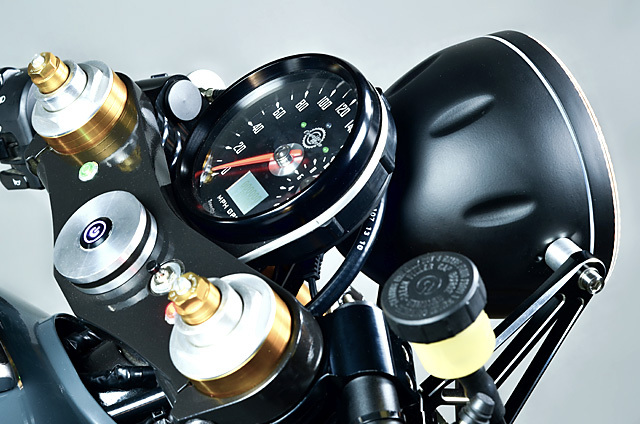 Incorporated into the triple trees stem is a push button start with the top tree machined to take a Cognito Moto GPS speedometer as well as neutral and oil pressure lights. Of course the stock R6 Clip-ons were swapped for CNC machined items and you guessed it, CNC’d brake and clutch levers. The R6 switchblocks do remain however and Andrei has neatly wired these into the stock connectors that feed the LED fork mounted turn signals at the front and LED tail light/turn signal combo at the rear. The stock flasher would have these things going ballistic so in its place is the absolutely tiny Motogadget m-Flash digital relay. Lighting the way is a Bikemaster LED H4 headlight that is held in place by CNC aluminium headlight mounts, with the final piece to the puzzle a Ignitech CDI computer. Not wanting to leave any part of the build anything but up to the highest of standards Andrei took the time to replace every exterior engine bolt with stainless steel items. With the drastically reduced weight and extra power to send to that new Michelin at the back the clutch has also been upgraded for a bullet proof driveline with a Barnett Performance clutch and springs feeding the ever reliable shaft drive. And before it was off to meet its new owner Andrei also fab’d up an alloy side standard and rear brake bar that look a mile better than the stock items and left raw give a great contrast to the back paint. Speaking of that owner “I just delivered it last night and the owner was as happy as a kid can be! That’s makes me extra pleased with the result!” enthused Andrei who despite doing this incredible level of work every day at BBCR gets his biggest thrill from seeing another Plastic Maggot embrace its new alter ego and give a huge smile to another satisfied customer.